I keep thinking on something that caught my eye re-reading “The Magician’s Nephew.” At the end of the book, (yes, there might be a spoiler or two here, but what’s wrong with you if you haven’t read this great book???) Digory – the main character – is lauded by Aslan for doing such a good job planting an apple tree that will end up being the defining symbol of protection upon the whole of the land. The trick of it is that Digory didn’t plant anything. The only thing he did was toss an apple in a near random direction the way any one of us would throw a rock at a river. Even so, the significance of the apple might have more to do with the “work” of planting than any physical labor. 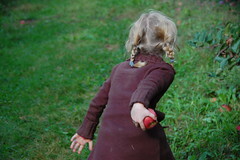 The apple had the power to heal his sick mother, and even more so to give everlasting life. And in an act of trust towards Aslan, he chose not to eat of it or keep it for his own agendas. To reference another great kid’s story Digory had a “Golden Ticket” that would be priceless in any context, but it’s as if he let it go to the wind – letting go the source of his hope; tossing it aside, I’m sure not so easily. Isn’t that how it is, trusting? I mean really trusting seems to come with a willingness to toss over my shoulder the very things I hold closest to my chest. And there isn’t a guarantee that the outcome will be as good as what Digory walked away with in hand. If anything, the only promise is that the good I had in mind isn’t the best. But even believing that requires a certain trust, also. The kind that has more to do with intuition and gut-sense than anything rational or definable… and often looks like tossing out the best I ever had.